With the Katowice Major coming to an end a few weeks back there was a lot of hype around the performance of ENCE which was followed by Astralis receiving a lot of applause and commendations for yet another dominating performance that too in a major. But amongst all the celebrations there were also a lot of broken dreams and hearts. Dreams of many talented players who missed out on a major victory yet again which broke the hearts of their fans and supporters. Not all the players were affected by the loss in equal measure, it was a pinch on the arm for some while a punch to the gut for others. Today I bring to you a list of five players who deserve a Major but have failed to seize one even after giving it their best shot. Oleksandr ‘s1mple’ Kostyliev, hands down one of the most mechanically gifted player in the world, has been a part of 8 CS:GO Major events from 2014 till present. S1mple has attended these Majors with HellRaisers, Liquid and Na’Vi. While also being featured in the ‘Top 20 CS:GO Players’ by HLTV consecutively for three years in succession from 2016-2018. Despite being spoken highly off by the critics, boasting an impressive overall rating, maintaining impeccable consistency and being complete in all sense of the game, s1mple has yet to win a major. His fans following is huge and quite frustrated at the moment. Regarded as one of the best players to have ever played the game, Major seems to be the only achievement alluding his touch. Ladislav ‘GuardiaN’ Kovács the 27-year-old from Slovakia has been playing Counter-Strike competitively since 2008. He is one of those players who has transformed and grown with the game itself, starting back with 1.6 and shifting to Global Offensive with time. A deadly AWPer, who has gained popularity due to his uber-aggressive AWPing. He is one hell of a player who can clutch and turn around any sort of situation, no matter how bad the odds are stacked against him. But one thing that the player cannot seem to obtain is a Major title to his name, GuardiaN has been a part of 13 majors till date and the closest he has reached is a second place finish, thrice. A CS veteran who has great individual talent and has showcased multiple phenomenal performances really does deserve a victory in a Major. FaZe has given him the freedom to play as he feels fit, hopes he takes full advantage of that in the next minor. Nikola ‘NiKo’ Kovač from Bosnia and Herzegovina broke into the scene in 2009 starting out with 1.6, staying on top of the professional scene all the way through to CS:GO. A talented player who is blessed with an inbuilt radar within him, he reads the game so perfectly which combined with his rock-steady aim is a concoction of pure destruction. NiKo made a big name for himself playing for Mousesports because of which his talents caught the eye of FaZe clan, the team that is made up of highly talented individuals. All is great for NiKo except for the fact that he still hasn’t laid his hands upon a CS:GO Major trophy. 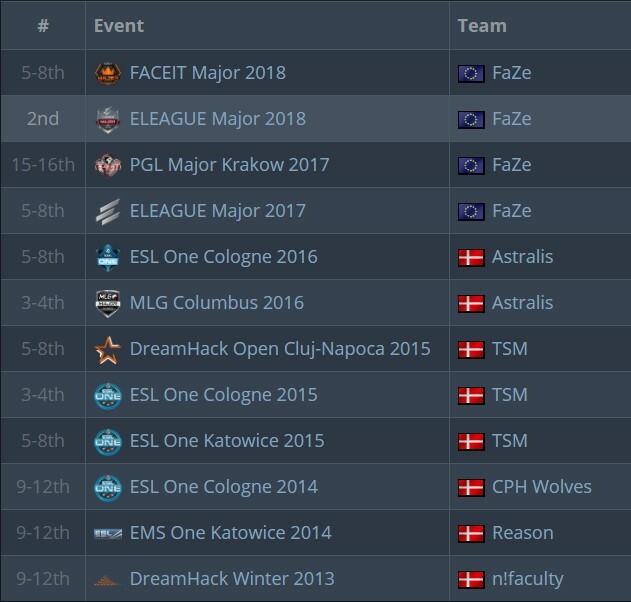 In a span of almost ten years, NiKo has attended 8 major events, 4 each with Na’Vi and Mousesports. As luck might have it, NiKo has not obtained a satisfying result in any one of them except for in Eleague Major: Boston 2018 where he bagged a second place finish. Finn ‘kariggan’ Andersen started back in 2006 with 1.6, moving to CS:GO in 2012. The 28-year-old has been playing Counter-Strike professionally since the past 13 years but even after spending more than a decade all he craves is a Major title to his name. Karrigan has played for multiple top-tier teams like Fnatic, Mousesports, Astralis, FaZe Clan and Team Envy but no matter where he went the thirst of winning a Major remained unquenched. He has participated in 12 majors till date with five different teams and most with FaZe Clan, four. Currently with Mousesports lets see if he is able to achieve a major victory anytime soon. Dennis ‘dennis’ Edman currently playing for NiP has been serving the Swedish side for about a year now and has been recently announced inactive but still a part of the organization. Another old school player, he has been in the professional scene for almost about a decade now. A bit of an ambidextrous player, who handles an AWP as well as a rifle, he is a highly adaptive player who fits into any position like the perfect piece of the puzzle required to serve any demands of the team. Highly talented and acquiring such a great skill set he has in his career still missed out on a Major title till now. In the 10 majors, he has only been able to go as far as to be the runners-up at the event, which is really disappointing. With a question mark on where he goes next from here let’s see if he is able to achieve the last standing achievement in his career or not. These are my picks of those players that have never won a Major but truly deserve the trophy in their shelves back home. Comment below which players are the ones that you think deserve to win a major.